You’re a photographer. Which means creating a photography invoice definitely isn’t something you learned in school like your designer or accountant friends. And yet, sending a photography invoice to your clients remains a daily or weekly requirement for photographers. But you don’t have time to open up Indesign and create a photography invoice from scratch every time you need to get paid as a photographer…am I right? 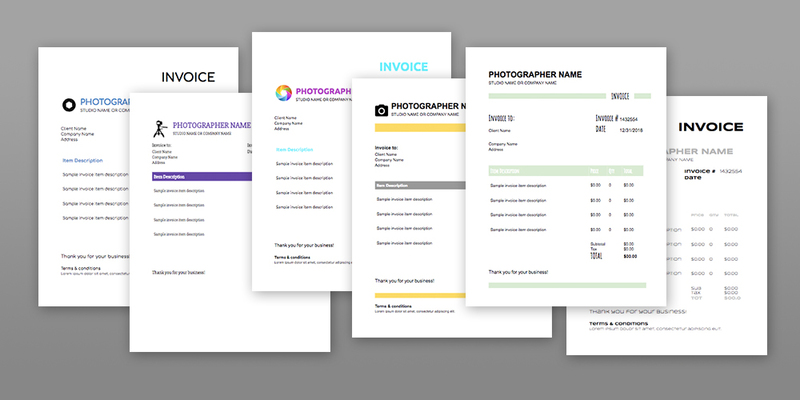 So, below, we’ve created 6 easy-to-use, ready-to-edit photography invoices. They’re built in Google Drive which means anyone with a Google Account can edit, print, download as a PDF, or email these photography invoices to your clients. No more sending awkward emails to your clients. No more wondering what should be included on your photography invoice. Now, you can download these 6 free photography invoices and start modifying and using them in your business today. Here’s a preview of the photography invoice collection you can download for free. What is the purpose of a photography invoice? Photographers should invoice their customers and clients once the work they agreed to do has been completed and they are ready to get paid. The purpose of an invoice (whether for photographers or anyone else) is to both notify your client it’s time to pay for the services you’ve rendered and notify them of the outstanding amount. When do I need a photography invoice? If you’re a photographer you almost always need to use a photography invoice to get paid quickly and efficiently. The only cases in which you might not need a photography invoice is if your clients register online and pay your fees through a web portal. Even then, some photographers and accountants recommend sending an invoice via email for the customer’s (and your own) records. What should be included on my photography invoice? It can be hard to know what to include on your invoice—particularly when you offer photography as a service. Beyond the obvious line items you’ll find on a photography invoice such as the Sitting Fee and the cost of the final prints (if you offer that), you might also want to consider including any editing fees, additional clothing change fees, overage fees, a suggested tip, and tax. All or any of these could be a good fit for your photography invoice. Remember to put everything you want to charge for in the “line items” section and then the subtotal and totals below. Each template in this bundle has already done the work for you. How fast will my clients pay my photography invoice? This all depends on what you include in the terms of the invoice. As the photographer, you get to decide how quickly you want to be paid. Many photographers choose to make their invoice “due on receipt” while others opt for a net 30—which means they have 30 days from the time they receive the invoice to pay it. You can also allow partial payments on your invoice or give discounts for quick payment. Should I invoice hourly or by the project? Many creatives, including photographers, wonder if they should invoice based on the number of hours they work for their clients or by the overall project that is completed. Additionally, many creatives invoice based on the value they bring to their clients or their clients’ business. How you invoice and price your creative work says a lot about you as a freelancer. And some creatives recommend blending 2 or more of the options below. The arguments for and against each kind of invoicing & billing (hourly, by project, by value) can fill endless books and websites and can’t be discussed at length here. Suffice it to say: it’s completely up to you as a photographer and business owner. Each method has its pros and cons, but your photography invoice should reflect the method you employ. With hourly pricing, your invoice will likely have fewer line items with higher quantities (representing hours). With project-based pricing, you’ll likely lump it all into one project—often times on one line of your invoice. With value-based pricing, you will likely list as many value-added items as you can as well as a few “bonus” items for $0 to show the added value you gave your client at no extra cost. What are the best photography invoice tools? If you want to streamline your invoice creation process a bit more, you can also try services like the ones below to make your invoicing process much more effective. Freshbooks invoicing — perhaps the best solution on the web for creatives who want to send invoices, automatically remind clients who forget to pay, and see detailed reports of monthly and annual revenue. Bonsai invoicing — a robust (but affordable) suite of tools for freelancers who want to do more creative work and less administrative tasks (like making and following up on invoices). Simple Invoices — the simplest option of the 3. Create invoices in seconds and keep credit cards on file so you get paid on time, every time.